An Electron-Multiplying CCD (EMCCD) uses an electron multiplying structure built into the CCD to greatly increase sensitivity; single photon detection becomes possible. This technology, like alternative Image-Intensified CCDs (ICCD), is still quite expensive, but lower cost products are now becoming available, such as the black and white cooled EMCCD sensors offered by Photonic Science. 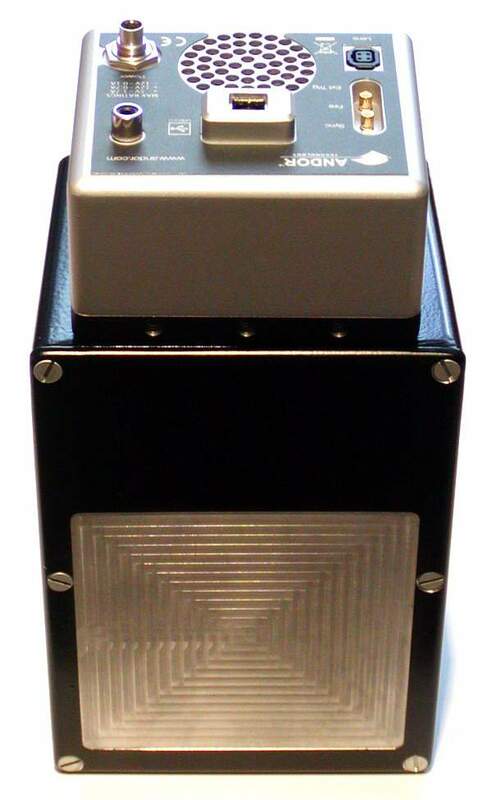 The NeutronOptics prototype EMCCD neutron camera, with 658x496 or 1002x1004 pixels, was cooled to -20C to reduce noise at high EM gain (x250) and isolated "hot" pixels were filtered out. It was placed 80mm behind a 3mm ruby crystal, backscattering from a white thermal neutron beam, on the ILL OrientExpress beam line. 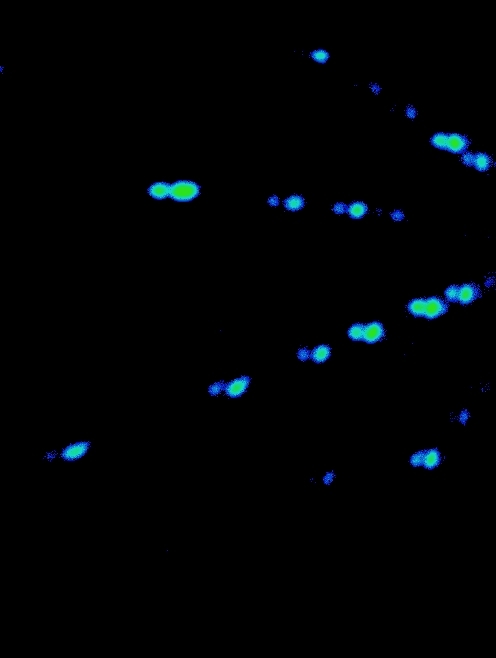 The second photo shows an image of the backscattered diffraction pattern obtained in only 60 seconds. The field of view is smaller than with the much more expensive 200x250mm OrientExpress dual image-intensified camera, and the sensitivity, dynamic range and S/N ratio are also less good at present, but the neutron diffraction pattern looks very similar. In particular, it is immediately clear that the ruby crystal is twinned, and the large number of Bragg spots obtained should allow orientation of the crystal axes. We can propose a relatively inexpensive 150x120mm neutron camera that might be used for both crystal alignment and other neutron imaging applications.